Ensure that your finished sauces and purees have a smooth texture with this Tablecraft 90 4 3/4" fine tin single mesh strainer! This 4 3/4" round tool is great for straining a variety of clumpy or grainy ingredients so you can serve your guests a finished product with the right consistency. It can even be used for sifting flour and sugar, as well as dusting powdered sugar over cakes. Mine came slightly warped and has only further warped over time with usage. The building quality is nothing to write home about, the wooden handle is already feeling worn after constant washing over a month of use. Thank you for your review, johnny! We are sorry this Tablecraft 90 4 3/4 inch Fine Tin Single Mesh Strainer has not met your expectations. A Customer Solutions Representative will contact you soon! The Tablecraft strainer works great for sieving flour and for straining sauce. if you are dealing with lumpy flour or thick sauce just run it through the strainer and flour is fine and fluffy and the sauce and nice and silky. I also use it to dust powdered sugar, cocoa powder and as a lime/lemon strainer. Quality at a reasonable price. Excellent price very handy tool in my kitchen all day for different chores. Good quality tool. My Employees love it. This is a high quality stainer that's sturdier than most and can handle every small straining task. The wood handle also provides a nice aesthetic. This strainer is very durable. I really like the sturdy wood handle. 4.75 inch diameter is good for removing solids from broth and other liquids. Excellent quality on these strainers. I like this particular size for sprinkling powdered sugar over desserts. A great value as well considering the quality compared to others. This strainer is fine enough to separate the pulp in some of my thicker blended soups. It can be used to clear broth and it can also be used to sift sugar or cocoa over desserts for presentation. This is a versatile and solid product. Great product with even better quality. The metal isn't weak at all and we use it to dilute our flavors! Definitely would recommend to other people. While in theory it would be possible to get a strainer of this size at a lower price, it would mean a severe drop in quality. This one is well made with a sturdy comfortable handle and well worth the price. I love using this strainer in my home kitchen when I don't want to dirty my larger strainer and only have a small amount of food or liquid to strain. Our bar staff love using the smaller mesh strainer. They fit perfect onto our bar shakers. It keeps out almost all seeds and debris for clearer cocktails. I would describe the strainer as "serviceable." It is reasonably sturdy and the mesh seems fine, but the wooden handle piece is rather rough, and causes the strainer to be unable to be washed in a dishwasher ( a huge negative.) It works fine and the price is very good, which is why it is 4 stars instead of three. I use strainer a lot in my kitchen. The size of this product is exactly what I most need. Just slightly in the middle, not too big and not so small either. Love it! Strainers are great for making smooth purees and sauces. This tool features a very thin mesh for a super smooth finished product. The hooks on the strainer allow you to rest it over a pan, pot, or bowl without worrying it will fall in. The strainer features a wooden handle and because of that we would suggest hand washing this item. 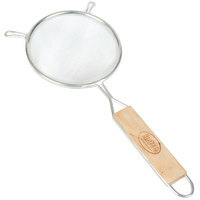 The Tablecraft 4 3/4" Fine Tin Single Mesh Strainer is highly reliable and versatile. The handle is firmly attached and it is dishwasher safe. I would highly recommend this to anyone looking for a great strainer. This is the perfect sized strainer for catching lemon seeds or for dusting items with powdered sugar. It fits perfectly over my 1 cup liquid measure. Affordable and study item that does many tasks. We use it primarily for sifting sugars on waffles and cakes. But also works well when making sauces, removing any zest or lumped berries. Great addition to our kitchen. Its a bit small but has its uses. I like to use these to strain bits from liquid. They work in a pinch for tea or removing seeds from lemon juices. This strainer is fairly small, about the diameter of the mouth of a pint glass. I use it fairly often to sprinkle powdered sugar, or to filter fry-grease into a wide mouth mason jar. Single mesh is plenty sturdy for my home use, a little dented but still perfectly useable. It can rust under certain circumstances, like if you leave whiskey stones to dry in it overnight, but just don't do that and it will be fine. Very happy with this product, would buy again. Just the right size to fit over and in a 2 cup standard measuring cup and strain small amounts of what ever you are working with, normally use it for smaller amounts of beans, rice, and noodles in side dishes. We use this for small jobs, usually for sifting powdered sugar into food, like pancakes, cakes, muffins, brownies, funnel cakes, etc. Just the right size. Nice little strainer for the money. I give it 4 and not 5 stars only because it is not offered in double mesh like the larger ones. This mesh strainer gets the job done. It holds up under heavy use and can be washed in our commercial dishwasher. It's a great buy! This strainer works very well and holds up to continual use. However, due to it's size, it does take a while to sift batches of flour. I think I'll be investing in a larger size to make things easier. I use mesh strainers for a wide variety of things. From staring sauces just in case of lumps all the way to teas. Thank you WEBstaurant Store for the price and wide variety of styles and sizes. This is great for fine straining. I would have given it 5 stars it it would go through the dishwasher. If you pull it out before the drying cycle you have no problems. if you don't the wood gets very dry and the ring that holds the mesh to the handle till rust. I found that quick spray with the spray at the kitchen sink with hot water cleans things with little effort, then shake and let air dry. this mess trainer is perfect for dusting powdered sugar as well as cocoa powder. It also works great for straining small amounts of liquid.I would recommend. This item is perfect for sifting flour, cocoa powder, powdered sugar, or anything you need to remove lumps. You can also use it for removing solids from liquids such as tea. A very handy little tool - the ideal size for sifting something into a jar, blender or other smaller container, and it's also small enough to use to scoop things out of a fryer etc. Points off for a rather rough and unfinished handle though - watch for splinters. I recently used this little strainer when helping a friend to fry doughnuts. It works perfectly to get little dribbles of fried dough out of the oil before the next batch is fried. Great little product that can lend itself to a variety of uses! This strainer is just great! It's a perfect size to use along with a 6 oz. ladle. It strained every bit of the skins and seeds from a raspberry infused simple syrup and rinsed clean in seconds. we bought this 4 3/4" tablecraft 90 fine single mesh strainer to measure out and drain out dill pickles that we fry. It was just the right size for this purpose. This has been a good strainer for us. We mostly use it to strain vegetable juice. It sits by itself across our 4 cup pyrex glass and does its job well. It can also hold about exactly 1 cup of black beans etc. when you want to rinse them, and they don't spill out, like when we try to rinse them in a colander. This mesh strainer is not so great for big jobs because of the size. But it is perfect for sifting flour or sugar or anything else you need to sift. No regrets with this purchase. This is great product to have. The very small holes make straining any sauce super smooth. Or you can sift flour any make the perfect cake. This works great for straining small portions of sauce and much more!! Great price for a hand strainer! Great for sifting powdered sugar on finished desserts!! This is great for sifting flours for baked goods right over the mixing bowl. Also great for sifting powdered sugar because of how fine the mesh is. This is a really sturdy product made to last, which is great for our bakery!